Human anti Ki67 antibody, clone AbD02531 recognizes the Ki67 cell-cycle associated protein. Ki67 is expressed in proliferating cells but not in quiescent cells. 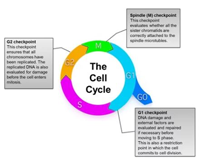 Expression of this antigen occurs preferentially during late G1, S, G2, and M phases of the cell cycle, while in cells in G0 phase the antigen cannot be detected. Consequently, Ki-67 antigen expression is used in tumor pathology to detect proliferating cells in neoplastic diseases. In cultured cells, Ki-67 is expressed in the nucleolus of interphase cells. The Ki67 gene contains 15 exons. The Ki67 repeat region, within which there is a 22-amino acid Ki67 motif, is encoded by exon 13. The shorter isoform lacks exon 7. Northern blot analysis reveals multiple transcripts ranging from approximately 8.9 to 12.5 kb in proliferating but not quiescent cells. Immunoblot analysis shows expression of 320 and 359 kDa proteins. Antisense oligonucleotides inhibit cellular proliferation in a dose-dependent manner, suggesting that Ki67 protein expression may be an absolute requirement for cell proliferation. Within cells Ki67 is predominantly localized in the G1 phase in the perinucleolar region, in the later phases it is also detected throughout the nuclear interior, being predominantly localized in the nuclear matrix. In mitosis, it is present on all chromosomes. Chimeric human-mouse IgG1 antibody selected from the HuCAL® phage display library and expressed in a human cell line. The antibody has variable regions of human origin and an Fc portion (including CH1 and CL domains) from mouse IgG1. It can be detected by anti mouse Fc specific secondary antibodies. This antibody is supplied liquid. Jarutat, T. et al. (2006) Isolation and comparative characterization of Ki-67 equivalent antibodies from the HuCAL phage display library. Liu, S.K. et al. (2011) Delta-like ligand 4-notch blockade and tumor radiation response. J Natl Cancer Inst. 103 (23): 1778-98.